This guide is intended to help you get started with Universal Office. It walks you through the most frequently used features (performed tasks) by health providers. In Patient Manager, search patients by last name, first name, or other specific search criteria, such as Patient ID, phone number, case ID, status, or case type. In Appointment Book, search patients by last and first name, phone number, or case ID. By default, when you type search keywords, the system searches by patient’s last name. In the search field at the top-left of the screen, type in a few letters of the patient’s last name. Press Enter on your keyboard, click [Search], or click on the drop-down arrow beside Search and select Last Name. Select the appropriate patient name from the search results. Next, select the patient case from the search results on the bottom-left of the screen. You can add ICD-10-CA injury codes to a patient case, as well as to OCF-3, OCF-18, OCF-21, and OCF-23 documents. 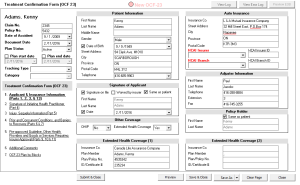 Open Patient Manager and select a patient with an MVA case. Select the patient case on the bottom-left of the screen. To the right of the screen, locate the Injury/Diagnosis section and click Add Injuries. Enter the injury description (for example, headache) in the search box at the top of the screen, and then press Enter. In the search results list, check the box beside every injury code you want to add, and then click Add Selection. The selections appear in the Patient Injuries List. Repeat steps 4 and 5 for every injury code you want to add to a patient case. Tip: If you know the injury code, enter it in a cell under the Code column in the Injuries List section (e.g. S1240). Click [New Document] on the toolbar, then select OCF-18 (Latest OCF version) from the Template type drop-down list. The system opens the OCF-18 Editor. Use the sections on your left to open, review, and complete the sections of the OCF-18. See Figure 1: OCF-18 Parts below. Note: Once finished, you can preview the plan, save & close it, or submit it to HCAI. 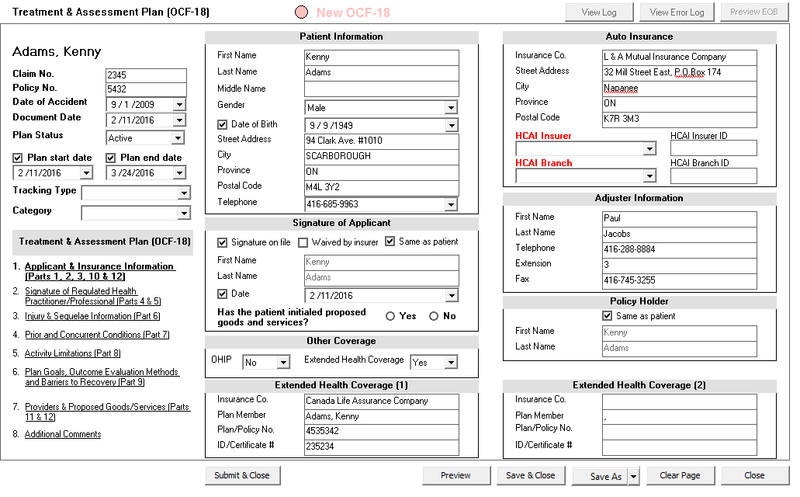 To create treatment plans faster, use a predefined OCF template. 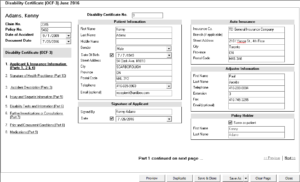 See Create and Manage Claim Form Presets article. Select a patient case on the bottom-left of the screen. Click [New Document], and then select OCF-23 (latest OCF version) from the Template type drop-down list. The system opens the OCF-23 Editor. Use the sections on your left to open, review, and complete the sections of OCF-23. See FIGURE 2: OCF-23 Parts below. Note: Once finished, you can preview the treatment confirmation form, save & close it, or submit it to HCAI. Click [New Document] on the toolbar, then select OCF-3 (Latest OCF version) from the Template type drop-down list. The system opens the OCF-3 Editor. Verify the accuracy of the Date of Accident and Document date. Use the section on your left to open, review, and complete the sections of OCF-3. See FIGURE 3: OCF-3 Parts. Once finished, you can preview the disability certificate or save & close it. 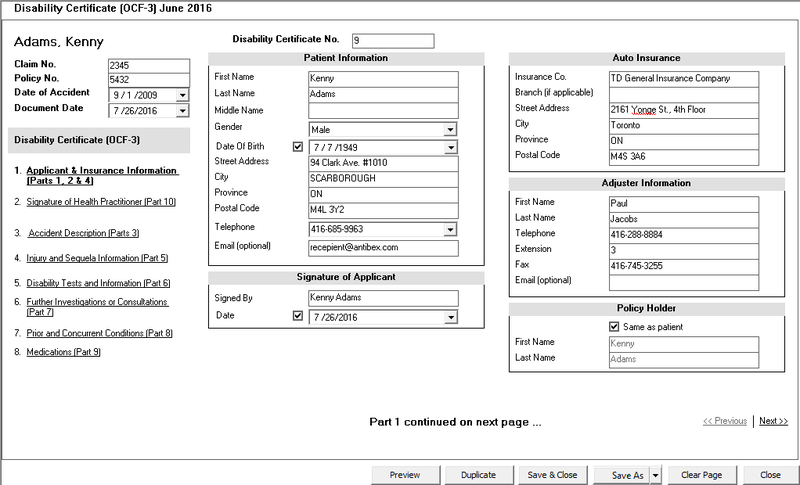 Applicant & Insurance In this page, complete parts 1, 2 and 4 of the OCF-3. Patient, MVA insurer, adjuster name, policyholder, as well as a few questions related to employment and schooling at the time of the accident. Be sure to complete both pages of Part 1. The Applicant Information has two pages (switch between pages on the bottom-right). Be sure to stay within the boundary of 500 characters for the explanation box. Signature of Health Practitioner In Part 10 of the OCF-3, identify the Health Practitioner. Accident Description In Part 3 of the Disability Certificate, provide a brief accident description (up to 2,000 characters). Injury & Sequelae Information In Part 5 of the OCF-3, the system pre-populates injuries already identified in Patient Case. Make changes to the list as required, by adding new or removing injuries from the list. You can also rearrange the order by injury severity using the arrows at the top of the Patient Injury List. Disability Tests and Information In Part 6 of the OCF-3, indicate the relevant details for the disability and test information as required. Be sure to complete both pages of Part 6. The Disability and Test Information has two pages(switch between pages on the bottom-right). Stay within the boundary of 400 characters for the explanation box in the first page and 500 characters in the explanation box on the second page. Further Investigations or Consultations In Part 7 of the OCF-3, indicate further investigations or consultations as required. Prior and Concurrent Conditions In Part 8 of the OCF-3, indicate the patient’s prior and concurrent conditions as required. Medications In Part 8 of the OCF-3, list any medications taken by the patient. Open Patient Manager and select a patient case. Open either the Documents, Correspondence, or SOAP Notes tab. See Organizing attachments below. Locate and select a file to attach, then click Save. This file is now attached to the patient case. Anyone with access to this patient’s file in Universal Office will be able to see and view this file. Documents Attach medical assessment reports such as the In-home Assessment report, Initial Assessment Report, Progress Report, and so on. Correspondence The received faxes and letters as well as email and telephone conversations records with insurers, lawyers, etc. can be stored in Correspondence. SOAP Notes Upload documents that relate to soap notes, such as the initial assessment exam form, progress notes, and so on. Besides the standard claim forms, you create other types of documents in your practice management such as Progress Reports, Assessment Reports, Soap Notes, and others. You can create either of them on a clean page using all available rich text format features such as bold, underline, and italic, or use a predefined template. In the Patient Manager, locate a patient and open a patient’s case. 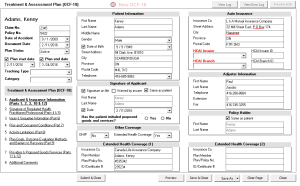 From Document Type drop-down, select Medical. Make sure Blank is selected in the Template Type drop-down. Enter the content, then click [Save File] on the toolbar. Enter Document Name, then click [OK]. Open the Soap Notes tab. Click [New SOAP Note] on the toolbar. 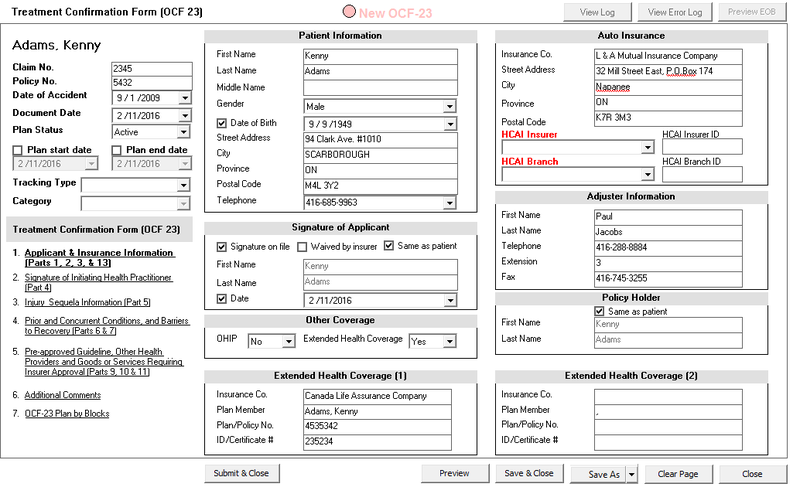 Enter Document Name, then click OK.
You can create custom templates for Medical Documents and SOAP Notes. For example, you can have a different template for each provider or professional college. You can create custom templates following instruction described in Create and Manage Text Editor Templates article or you may want to order custom templates by placing a request with us. For conversations as well as letters, faxes and email exchanges, you can maintain correspondence and case notes for each patient case. Click [New Correspondence] on the toolbar. From Correspondence Type drop-down, select one of the types and click Open. Note: Depending on the correspondence type you selected, the system will open the respective window. See Correspondence Types below. Record your correspondence, then click Save & Close. Case Note The case note can be used to document case activity information. You can give your case note a subject, date you logged the note and description. - Fax You can create a general correspondence note, or you can specify its type such as Email, Phone, or Fax. (rich text format) This opens a blank page where you can enter any text and apply rich text editing. You can also have your own predefined letters to adjusters, lawyers, etc. uploaded into the system. Those templates can have patient and claim information automatically populated into the letter. (system templates) The Letters to Legal reps, MVA adjusters, etc. are created using a Universal Office letter editor where the letter template is broken down into sections.